Extreme hand stretch wrap is the next generation in cast stretch film extrusion technology. The Extreme hand stretch wrap delivers superior puncture resistance, high prestretch levels and exceptional load retention. These properties make the Extreme hand stretch wrap film the perfect choice for replacing standard 60-70ga, 80-90ga, and 120-150ga stretch films with a significant cost savings. For example a roll of 18" X 1,500' 80 gauge hand stretch film has an average cost of $15.25 per roll on the web. 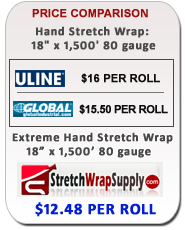 That same roll of our 18" x 1,500' 80 gauge equivalent Extreme hand stretch film cost is $12.48 per roll, Saving you roughly $2.75 per roll with our Extreme Hand stretch films.